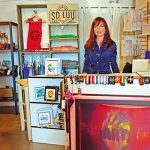 For more than 35 years, the Bazaar del Mundo, in Old Town San Diego, has hosted Santa Fe Marketplace, a Southwestern art show and sale. This year is no exception. 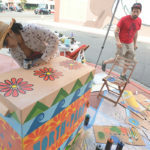 The popular event will be Sept. 15 and 16, from 10 a.m. to 7 p.m. 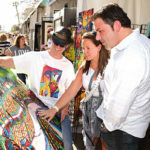 Shoppers can meander a vast selection of fine arts and crafts in the outdoor marketplace, have a bite to eat, and learn directly from the artists about the unique characteristics of their work, which originates in the U.S. Southwest and Native American cultures. Visitors can even bring one or two pieces from their own collections for appraisal by an expert. Leslie Gregory, manager of The Gallery at Bazaar del Mundo, explained that the jewelry, paintings, clothing, rugs and other items in the marketplace have a uniquely Southwestern look. It is defined by distinct images, patterns, and both the subtle and brilliant colors of the desert — earth tones, rich turquoise, a spectrum of coral reds and vibrant blue lapis, among others. 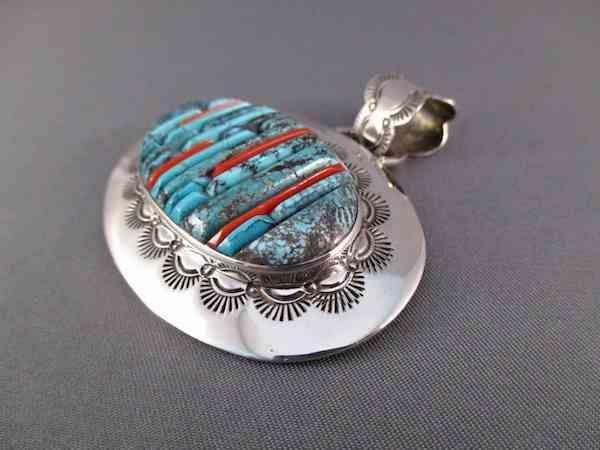 Jewelry artist Veronica Benally, of the Navajo tribe, and one of the exhibiting artists, added that Native American jewelry is also distinguished by the traditional use of stamped silver and various natural materials, including shells. Benally is an award-winning designer, considered among the best contemporary Navajo jewelers — and a woman creating art in a historically male space. 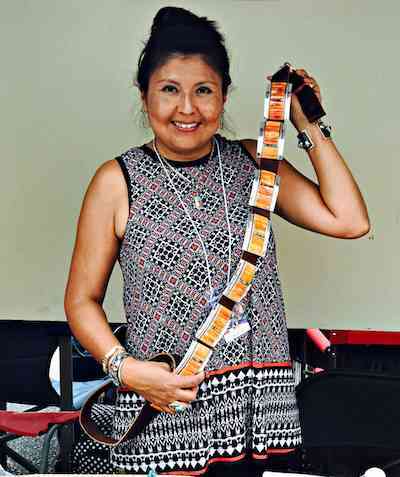 She has found inspiration in other women, including the renowned Zuni artist Veronica Poblano. Both of them are known for blending the traditional and the contemporary. Benally works with her husband Ernest in Gallup, New Mexico. “We do the stamp pattern using the tool on the silver,” she said, “but we also create channels, areas where we can inlay stones. The blend of old and new is a common theme for other artists showing at the Santa Fe Marketplace — a necessity, perhaps, to maintain and attempt to build an audience for Native American arts, the market for which ebbs and flows. John Balloue, an Indian Arts and Crafts Association Artist of the Year, has been painting full time for almost 25 years, and his style has shifted between realism to “a more contemporary look,” sometimes straddling the line between the two to keep up with collectors’ preferences. 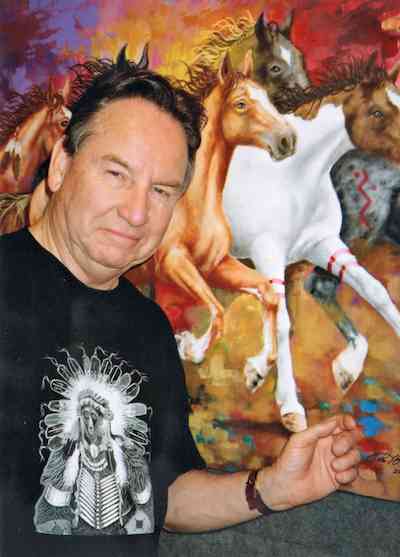 He now typically paints traditional Native American subjects, but with bold colors and brush strokes. Balloue, a Vietnam War veteran whose father is part Oklahoma Cherokee, returned from the war, studied art, and began painting portraits. As he learned more about his heritage, though, it appeared in his work and, eventually, dominated it. 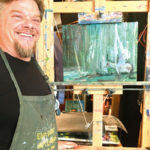 “Over the last 15 years or so,” Balloue said, “I’ve done a lot more contemporary type of work. 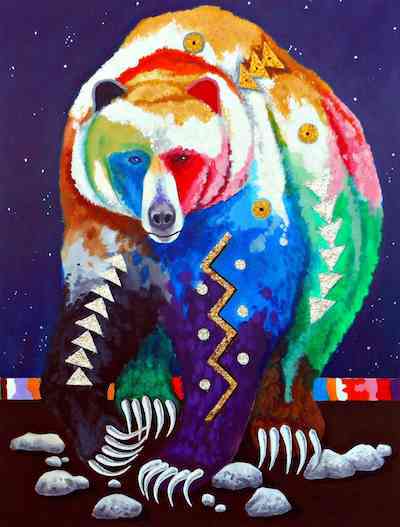 Like using color in a nontraditional form, representing animal figures in bright colors. 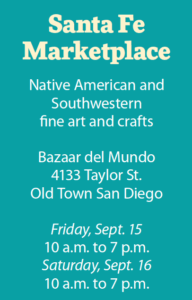 In addition to meeting the artists and enjoying the arts and crafts, visitors to the marketplace can bring up to two pieces of Native American jewelry or other family heirlooms to be appraised by Art Quintana, an expert pawn trader. He described the typical scenario for people who bring objects to be appraised. “It’s something they’ve had, were curious about, and I give them the history about it and the value. There’ve also been some really nice pieces. 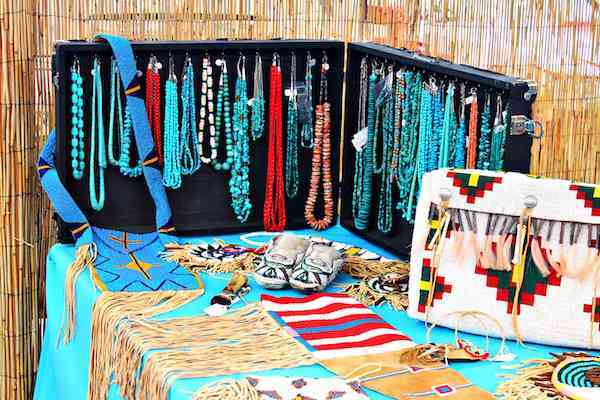 While there will be plenty of utilitarian items for sale at the Santa Fe Marketplace, from bolo ties to earrings, the work is equally as valuable for its aesthetics, its beauty. And the opportunity to meet the artists and understand their creations adds even more. And the best of Native American and Southwestern art is on it way to San Diego.